A world leader in gems and jewelry, Thailand showcased its prolific industry at the 58th edition of the Bangkok Gems & Jewelry Fair, held September 7 - 11, 2016. Extraordinary ruby and diamond necklace in gold by Thai brand Beauty Gems. Multi-colored gemstone and diamond jewelry in gold by Thai brand Blue River. Gemstone and gold ring and earrings by Thai brand Dhevan Dara. 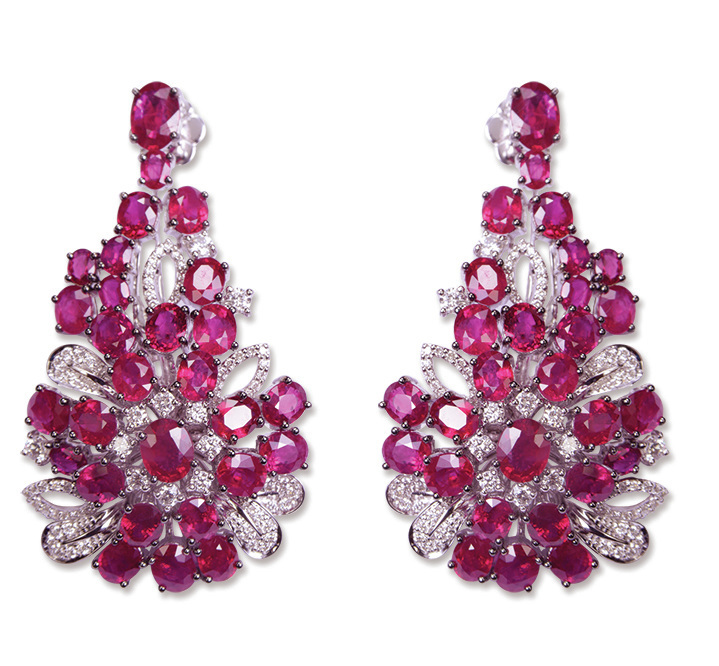 Ruby and diamond earrings by Duang Kaew. Sapphire and ruby rings in gold with diamond accents by Pranda, one of Thailand's premier and oldest jewelry brands. Creations by Bangkok-based Jon Michel include modern designs. One of the six themed concept exhibits was Pet Parade, featuring this gold and gemstone dog collar by Kanpoj. A display by Myanmar company Dana Hline Gems & Jewellery featured spinel, zircon and peridot, among other gems. According to Ms. Nilar Saw, the most popular colors of spinel are light pink. Spectacular spinel necklace created by Myanmar gem and jewelry manufacturer Fully Jewellery Collection. Among the beautiful rough gemstones at the BGJF were examples of kunzite, including pink, green and yellow col- ors, from Zorab Creation. ​ Supported and organized by Thailand’s Department of International Trade Promotion (DITP) under the Ministry of Commerce, the Bangkok Gems & Jewelry Fair (BGJF} takes place biannually to support and showcase the Thai gems and jewelry industry, the nation’s third largest export sector after automotive parts and electronics. Having generated more than $7.2 billion in revenue in 2015, the sector is expected to increase some 10 percent this year, according to Ms. Chantira Jimreivat Vivatrat, Deputy Director-General of the DITP, who indicated that the most growth would be seen in the gemstone sector along with silver jewelry exports. A true global center, the Thai industry is made up of three main segments: (1) gemstone heating, cutting and polishing; (2) jewelry design, casting, setting, polishing, quality control and packaging; (3) sales in domestic and international markets. Employing some 1.3 million people, the Thai industry relies on skilled craftsmanship, original designs and modern technology to produce jewelry competitive in international markets. A significant share of this fine jewelry is third-party production that Thai manufacturers carry out for many foreign brands, including a number of well-known global luxury brands. These pieces are mainly crafted in gold, diamonds and gemstones. The nation is also the world’s second largest supplier of silver jewelry, right behind India. A number of production facilities are located in tax-free zones, such as Gemopolis, on the outskirts of Bangkok. Here, foreign companies benefit from a strong infrastructure, easy access to raw material sup- pliers and a skilled workforce offering high-quality workmanship. This past September, the DITP rolled out a new look for the show, comprised of 791 vendors that presented their wares in 2107 booths. Of these, 640 were domestic companies while 151 were from overseas. Among the foreign exhibitors were a number of companies from the ASEAN nations—mainly Myanmar, Laos, Cambodia and Vietnam, all part of the recently created ASEAN Economic Community (AEC). Thailand is at the heart of the growing AEC bloc, and is at a definite advantage with its decades of experience as a trad- ing, manufacturing and gem-lab hub. The most abundant gems from ASEAN exhibitors were the many colors of spinel, along with zircon, peridot, jadeite, rubies, sapphires, amber, and other stones. The largest percentage of exhibitors, and the leading growth sector in the Thai industry, was the gemstone category, both domestic and foreign. These booths were also the ones that attracted the most attention. Stones ranged from large rough samples to faceted colored gems of all kinds, including diamonds. Even the exotic melo melo pearls from Myanmar were available at the show, although at rather steep prices. Finished jewelry, especially silver, was also on hand, at all price points, as well as costume jewelry and very high-end pieces. Machinery, packaging and diamonds rounded out the offerings. One of the more interesting special exhibitions featured six themed areas with jewelry created by a new generation of designers: Viva for 60+, elegant gems for seniors; Pet Parade, delightful jewels for pets and pet lovers; Gemstlemen, jewelry for men; The Moment, special event pieces including bridal; Culture Club, stimulating arts and crafts designs; and Spiritual Power, jewels representing auspicious beliefs, horoscopes and spirituality. Young designers and students were also featured at booths sponsored by the Gem & Jewelry Institute of Thailand (GIT) and two universities. Serving as a sort of incubator for young talent, the BGJF places great importance on encouraging the next generation of Thai designers. One of the important special services at the BGJF was the successful and popular “Business Matching,” with appointments made in advance by buyers seeking particular companies or products at the show. Another useful service was the “Design Service Society,” which provided one-on-one consultancy on gems and jewelry in the country. Among the interesting seminars was “Discovery Gemmiferous Nation” by experts from raw-material- producing countries such as Sri Lanka, Mozambique, Myanmar, Madagascar and Tanzania. Recent efforts towards securing zero-duty status for the industry, in order to bring it closer to the situation in Hong Kong, have born fruit. On February 9, 2016, the Thai Cabinet approved a number of tax exemptions aimed at promoting the nation’s gems and jewelry industry for importers or sellers who are registered as individual traders. It has waived the value-added tax (VAT) on imports of un- polished diamonds, colored stones, rubies, emeralds, topaz, garnet, opal, zircon, chrysoberyl, jade, pearl and gems (although not on imitation or artificial items). Individual importers will also be exempted from paying personal income tax on money earned from selling unpolished gems and pearls, and will pay a one- percent flat tax on income instead. Other exemptions include exclusions for import duties on machinery and tools that enhance manufacturing efficiency and essential materials such as polishing blades and diamond dust, silver chain coils and rolls, as well as gems and jewelry products during the BGJF (one-month grace period). Anecdotally, traffic at the booths during the 58th BGJF seemed slow. This was not unexpected or even surprising since all the trade shows this year have been quiet. Having said that, however, I spoke with buyers from Italy, Australia and the United States who stated that they were indeed buying, and the lesser number of visitors gave them more chance to spend time with exhibitors and find what they were looking for. ​ The Gem & Jewelry Institute of Thailand (GIT), is among the world’s leading gemological laboratories. Under the directorship of Professor Pornsawat Wathanakul, the CIBJO-registered laboratory has highly experienced gemologists and is equipped with the world's most advanced instruments. The GIT is also a member of the Laboratory Manual Harmonization Committee (LMHC), made up of the world’s seven leading gem laboratories. The GIT is also cooperating with partners from China, Japan, Sri Lanka and Tanzania to establish cer- tification standards for gemstones, especially ruby and sapphire. In its Master Sets, the organization has stan- dardized colors for Pigeon’s Blood Red rubies, as well as Cornflower Blue and Royal Blue sapphires. ​ A government-supported organization, GIT also provides education and training, along with other pertinent information in the gem and jewelry field. The 59th Bangkok Gems & Jewelry Fair will be held February 22 to 26, 2017. For more information on visiting or exhibiting, visit www.bkkgems.com. Silver in many forms was a main attraction at the BGJF, from simple forms to highly delicate and intricate traditional styles. Shown here is a selection of silver jewelry and belts (each belt weighs more than 600 grams) handcrafted by Mr. Ratchanon Prasomsap of Thai silver manufacturer, Pradaporn Silver Thatphanom. Men's silver jewelry by Thompson Brothers that was featured in the Gemstlemen's themed concept exhibit.